England women's wicketkeeper Sarah Taylor could play for Sussex men's second XI if required. 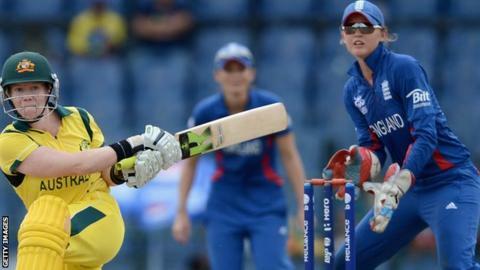 The 23-year-old, one of the leading players in women's cricket, says national coach Mark Lane is seeking men's matches for her to play in. "Mark is looking at me getting some games with the second XI at Sussex," Taylor told the Guardian. An England and Wales Cricket Board spokesperson confirmed talks had taken place on the matter. The ECB said it would not block any move by Sussex to field Taylor, but that it was not a development it was actively pursuing itself. Taylor, who is preparing to travel to India on Thursday as England look to defend the 50-over World Cup they won four years ago, is relishing the prospect of playing with Sussex. "Mark is trying to get me a lot of men's cricket which can only help my game," she said. "It's just a case of there could be an opportunity for me. Someone at Sussex approached Mark and asked if there was anyone who could keep wicket and Laney, being Laney, was quick to back me. "It's daunting but it's brilliant that he backs me to do it in men's cricket. The MCC also approached him about me playing for them." However the England batter, who is also vice-captain of Sussex Women and is the top-ranked player in the International Cricket Council's batting rankings, admits the ground-breaking move would be tough. "Part of me knows it would be phenomenal. But there's part of me doubting myself. I've just got to start believing in myself a little bit more," she added. "But I would love to do it. It would be such a challenge."